I commend Richard Horton (Nov 2, p 1612)1for discussing Israeli military occupation of Palestinian land, including the siege of the Gaza Strip, and the effects this occupation has on health and access to health care. Horton's Israeli colleagues responded in a tone that blames the victim. They emphasise their “desire for Palestinians to enjoy the very highest quality health care possible”, call for “improved collaboration between Palestinians and Israelis to advance Palestinian health”, and express a strong wish to improve the health and wellbeing of their Palestinian neighbours. Yet they hide behind the so-called security, political, and economic barriers to progress, which they described as severe, without explaining their origins. These arguments will most likely fall on deaf ears, but, yet again, the main issue these colleagues need to acknowledge is the cause of death, injury, disability, ill health, and suffering largely befalling Palestinians, and some Israelis, although far from equally. The fact remains that Israel is militarily occupying Palestinian land and that this is precisely the root cause of ill health in the region. Palestinians and Israelis are often described as equal when they are not. Israel is a military occupier of Palestinian land and is known for its many human rights violations and abuses and for actions deemed illegal by all the relevant UN conventions. This includes illegally confiscating and building Israeli colonies on Palestinian land occupied in 1967 and controlling water and other resources, which threatens Palestinian homes and communities and is gradually pushing Palestinians out of territories acknowledged by the UN as what should be part of a Palestinian state. This is land grab. Israel is also known for its huge economic, political, and military power and superiority used to will Palestinians into subjugation instead of brokering a solution to the chronic Palestine–Israeli conflict. By contrast, Palestinians militarily occupied by Israel are enduring chronic exposure to Israeli violence (including threats to their survival) and are rightfully resisting oppression and injustice. The Palestinians are a captive population, and a people in danger. My colleagues at Birzeit University and I have tried dialogue and collaboration, but it just does not work for structural reasons. I have tried dialogue with Israelis for at least a decade during in the 1980s and early 1990s, going from one home to another, one university to another, one public hall to another, speaking publicly with colleagues from Birzeit University, both to and with Israelis, explaining and thinking that with dialogue and collaboration, we would be able to change the mind of Israelis and help them understand that Israeli military occupation is bad for the health of both Palestinians and Israelis. But a decade passed and nothing changed. I have reached the conclusion that as long as Israelis are benefiting from occupation, economically and otherwise, the chances are that they will continue to hide behind security situations and their intentions to improve the health and wellbeing of Palestinians, stopping short of calling for the end to occupation and for justice for Palestinians. Some Palestinians work closely with a very small minority of Israelis who are on the side of justice. This brings me to clarify that the discourse on the Palestine-Israeli issue is problematic because sides are usually taken as either Israeli or Palestinian. In fact, sides are about being on the side of justice or not. Indeed, a minority of Israelis are on the side of justice for Palestinians, and we cooperate with such groups, including Physicians for Human Rights Israel and other groups and individuals who work and call for an end to Israeli military occupation of Palestinian land, and are close friends at that. Some Israelis (and some Palestinians) are not on the side of justice, and we do not want any collaboration with these people. It would be like placing a plaster on an infected wound, covering up an ugly reality. Horton's colleagues need to recognise that Palestinians do not need Israel's help to improve health, yet this seems to be their way of absolving themselves of the responsibility of standing up for truth and justice. The logic is incomprehensible: the Israeli army destroys the health system in the occupied Palestinian territory, and it bombs, shells, and shoots Palestinian civilians. 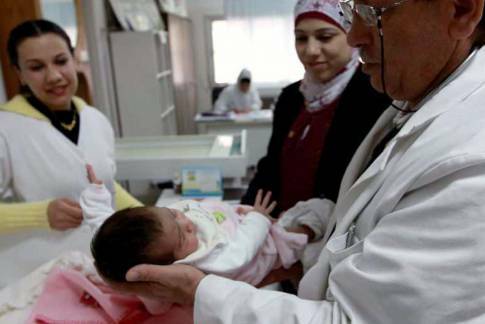 Yet instead of calling for the end of onslaughts on civilians and the end of Israeli occupation and colonisation of Palestinian land, Israeli medical professionals call for collaboration to advance Palestinian health. Not only does this not make sense at all—it is insulting. Palestinians do not want Israeli charity. What Palestinians want is freedom to reconstruct and develop our own society. Palestinians also want and deserve justice and freedom. Only then can peace be achieved. This article was published in The Lancet, November 2 2018. Offline: the health of Palestinians is a global responsibility. Right to Health: crossing barriers to access heath in the occupied Palestinian territory 2017.